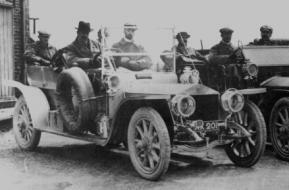 Claude Johnson selected the 12th chassis, 60551, on the short 135 inch wheelbase as his publicity vehicle and ordered a semi-Roi des Belges open body from Barker & Co. on March 6th 1907. It was specified that the coachwork would be painted silver and that upholstery would be in green leather. Lamps and other external fittings were to be silver plated. Price of the body was £110-14-0 and the chassis retailed at £950 plus £7-l0s for the aluminium dashboard fitted as an alternative to the usual polished teak. On May 3rd, 60551 was driven to Bexhill then north to Glasgow, accompanied from Hatfield by a White steam car, both cars being under RAC observation. They went on to cover the tough route proposed for the 1907 Scottish Reliability Trial before returning to London. Between May 3rd and 14th The Silver Ghost completed 2,000« miles under official observation, recording a best fuel consumption of 23¬ mpg for one section. On the route north Claude Johnson had driven the 518½ miles to Glasgow using third and fourth gears only. At the conclusion of the trial, performance was measured on Bexhill track - there was a 20mph overall speed limit - with 54.94 mph recorded in the direct third gear, in which 3.4 mph was possible. Such flexibility was important to Edwardian motorists, many of whom were incapable of changing gear on the move. Apart from punctures, adjustments during the twelve days had amounted to only 1 hour 28 minutes. After a thorough technical examination and dismantling no wear measurable by micrometer was found in the engine, gearbox, rear axle or brakes. To bring the car back to 'as new' condition two front wheel pivot pins, one steering rod tie pin, the ball tip of the steering lever, magneto driving joint, fan belt and petrol strainer were replaced. The steering ball joint's sleeve was refitted and the valves were reground. "Had the car been in the hands of a private owner no replacements would have been considered necessary," stated the RAC report. Cost of all replacements and servicing during the 15,000 miles and putting AX-201 back to 'as new' condition was just £28-5s-0. 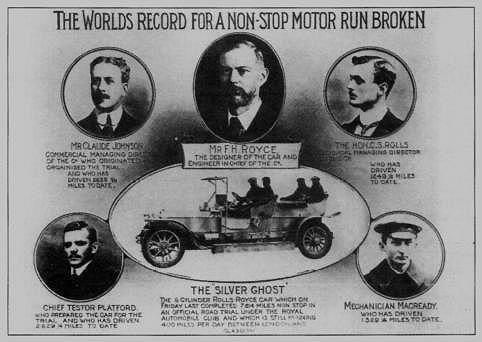 The annual running costs of a RollsRoyce, for 7,500 miles, was calculated at only £46-18-0, excluding tyres. Claude Johnson had taken The Silver Ghost on holiday to Cornwall in September 1907 and continued to use her after the motor show. She ferried guests to the opening of the new Derby factory on July 9th 1908 but that was one of the last occasions on which she served Rolls-Royce. On July 14th she was sold for £750 but the purchaser, Daniel Hanbury, did not take delivery from Conduit Street until September 2nd 1908. In the meantime the chassis was thoroughly overhauled, the silver plating was renewed and a new set of rear wings fitted. 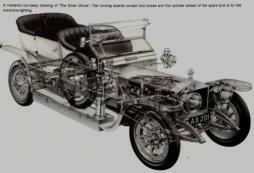 A feature of The Silver Ghost's Barker body, presumably for easier servicing during the 1907 trials, was that it incorporated the patent Wiindham detachable rear section, enabling the rear seat to be removed. In the Hanbury ownership AX-201 was often in this guise with a huge box fitted instead of the rear seat, replaced only for touring. That was extensive both in the U.K. and abroad as the family had a villa in Italy and visited Switzerland for winter sports. 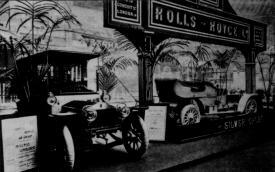 On such occasions two Rolls-Royce motor cars were used, AX-201 heavily laden with luggage and spare tyres. Such overloading caused frequent broken springs on the rough roads of the day. In 1925 the continual pounding took its toll and when touring in Italy the chassis was cracked. Temporary repairs were made by plating, and in 1930 the works at Derby re-plated the cracks, but AX-201 was little used after 1925.